Actor Stephen Fry, beloved at our house for his early 1990’s stint as P.G. Wodehouse‘s butler/hero Jeeves, has turned his creative attention to podcasting. Calling his subscribeable, downloadable audio a “podgram,” the first episode details the story of breaking arm on a movie-making trip to the Amazon. 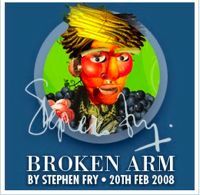 The enhanced podcast is available via his site, StephenFry.com, which he calls a “place in which to browse peacefully and without being harangued, harassed, heckled or hectored.” The first episode is interesting and relaxed, just Fry telling stories of what he’s been up to (writing, acting in movies and television, traveling the fifty US states, making documentaries about vanishing species, getting pins in his broken arm). Maybe I’m a big dork (yeah, you already knew that), but I could listen to Stephen Fry talk about nearly anything. He can make everyday fare into a great story. The feed is available through iTunes or here.